When I was younger I remember playing with a simple film camera and thinking it was just a toy. There was this one time when I didn’t know the film had to be rewound before opening the camera and ruined about half the roll of film. Needless to say a lot has changed since then. Throughout my life, both of my parents have had cameras and enjoyed taking pictures. For a while I took a break from film cameras, but once I started school in the Upper Peninsula of Michigan, I returned to photography like my parents, but this time I explored digital photography. 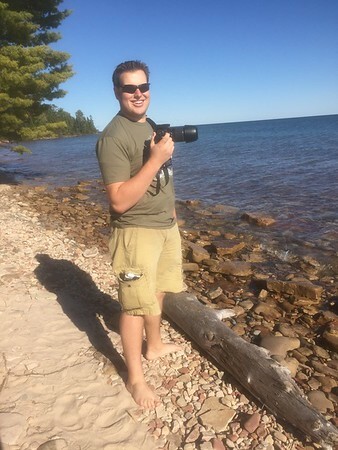 I have always loved being outdoors and photography is a great way to get out there and capture the beauty of nature, especially in the Upper Peninsula. Since picking up a camera again, I have worked to develop my photography skills and my own style of taking photos. I enjoy working with people as subjects in portrait photography but also find time for my love of nature photography. As you browse my site you will see a variety of photography, from nature to portrait to special events. Please feel free to leave comments on photos and share them on social media. If you are interested in purchasing any prints you discover on my website feel free to contact me to inquire about printing prices and sizes. Head over to the browse tab to check out a wide variety of photos and I hope you enjoy all of my photos as much as I have enjoyed taking them.